The prototype, Maher_N401DM, was built in 7 months, and first flew in the summer of 1985. It weighed 1,100 pounds empty, with a gross weight of 2,550 pounds and a Lycoming 180 HP engine and composite prop (built by Danny Maher). Cruise was claimed as 220 MPH. Flight testing of the prototype was completed in mid-October 1985, and thus did not attend Oshkosh Airventure, but was debuted at Sun-n-Fun in 1986. That first airplane, with a serial number of DMO40, was registered as N401DM. 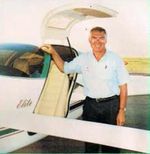 This airplane was flown by Billy Henederson of Sport Aviation, who noted 1500-2000 FPM climb rates and a top end of 184 KTS. This first aircraft also featured a retractable nose gear similar to the Long EZ or Cozy. Note that the original aircraft did not have full-length rudders. The serial numbers started with DMO - which stood for Dan Maher Original - number 040. It's rumored this was to avoid anyone getting worrisome "serial number 1". The fuselage was 42 1/4" wide, 40" high, and 81" long. The main wing area was 96.4 square feet and the canard was 19.75 square feet, for a total area of 116.15 square feet and a gross loading of 19.37 lbs/sqft. The outer wing panels are modified Long-EZ panels, but the strakes and canard are of a unique design. Roncz vortillions were added to the main wings. The aileron push-pull cables were Morse marine style, because Maher was familiar with their operation. The brake master cylinders were from the Datsun/Nissan B210's clutch. Build time was estimated at 800-1000 hours with the kit in the $18,000 range. The kit featured 43 1/2" wide fuselage, 41" high, and 81" long. The size of the wings and canards are slighty increased compared to the prototype. Danny is the registered builder of 4 Velocitys (DMO040, DMO100, DMO255, and 029; N401DM, N7044Q, N255DM, and N4253M registration). (NOTE: The advertised wing dimensions on production aircraft were a span of 28.63 FT, for a wing area of 125 SQFT, and wing loading of 19.6 lbs/SQFT). Due to the "deep stall" issue, 60" leading edge cuffs were offered to existing aircraft owners. The cuffs are required for DMO serial numbers below 115. The 173 (later known as the "Long Wing") was offered in 1992. The name was a play on the Cessna 172, and was meant to tame the handling characteristics to the point where any pilot could comfortably handle it. The 173 was intended to be unpaved-runway-capable, with sturdier gear that stand about 2.5" taller than the original, with bigger 6.00x6 main wheels, more wing and canard (20%) span, and a thicker airfoil, and a 58 MPH stall speed and 190 MPH top speed. The wing trailing edge was extended to the aft edge of the tip sails, and the aft inboard camber was changed. The new "Standard" wing dimension were 29.4' span, 122 SQFT wing area, and the 173/Long Wing dimensions were 31' span, 145 SQFT wing area. You can tell the 173 wing from the original in that it has much less area, and the trailing edge of the wing does not meet the trailing edge of the winglet, as it does with every newer model (SE or XL) Velocity. The Elite gull-wing door was first offered in 1995, and had a center keel instead of a seat-back bulkhead. The popularity of the type exploded with the Elite, as the "Top-Loader" style of accessing the cabin required some dexterity. 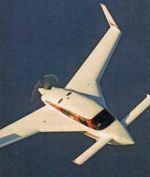 In March of 1997 Velocity debuted the XL (October 1997 Kitplanes "XL Debut" 13), an "Extra Large" Velocity. The XL uses the same "Long Wing" as the older "173" model, but with a significantly enlarged cabin that allowed mounting the larger, six cylinder engines with larger strakes for fuel. The original design work for the XL was done by Jean Prudhomme with some work by Jeff Kerlo, and received rave reviews in the press. In 1998 the fast build (fuselage and wings) was offered. At Osh Kosh Airventure 1999 Velocity debuts the SUV, the "Sport-Utility" Velocity to cash in on the SUV craze of the early '00s. It is billed as the entry-level (19) Velocity, offering only one gull-wing door, a cut-down keel, and control yokes that could be ready to fly for under $50,000 US. Discontinued at the end of 2002, with many SUV purchasers converting back to dual doors. In 2003, June, the XL-5 or "Dash 5" was introduced. The primary change for this new model was a bench back seat (with a small cut-down keel) that allows 3 children or smallish adults to be seated. The gross weight was also bumped up slightly, and the new toe-brake option was introduced. The toe brake option makes it less likely that you will land with a brake depressed, but removes the ability to deploy both rudders at the same time. In 2007 the factory built the first TIO-550 Velocty, "Turbo Charlie", which went on to set a new speed standard for the class with true airspeeds over 250kts. In 2008, the factory sold Turbo Charlie and is set to debut "the hotrod" with direct-push-tube controls and other modifications for these higher speeds. [The Twin] has been "in development" for quite some time. It was a big deal a few years ago, and I think the fuselage had been started, but a lot of other priorities got in the way such as "Turbo Charlie", and it's was in limbo for some time. There was a model shown at Oshkosh, however, pictured below, from Airventure 2006, and serious construction started in mid 2011. The airworthiness certificate was awarded, the first flight completed on 3/13/2012, was display ed at Sun-n-Fun 2012 for the first time. This page was last modified on 21 November 2012, at 13:04.